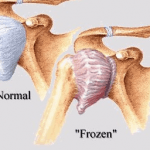 A frozen shoulder, also known as adhesive capsultitis, involves thickening of the shoulder joint capsule, resulting in significant decreased range of motion and stiffness. This can occur spontaneously, be linked to an underlying inflammatory process or result from increased scar tissue formation postoperatively. Generally, frozen shoulder will resolve over time with conservative measures including aggressive physical therapy, ultrasound-guided cortisone injections and oral anti-inflammatories. In extreme cases, failed to resolve with conservative measures and physical therapy, surgical intervention may be necessary, consisting of a shoulder arthroscopy to release the capsular stiffness, break up scar tissue and manipulate the arm to regain motion. This procedure requires aggressive physical therapy the following day postoperatively.